Friends of the San Francisco Public Library was founded in 1961 by Marjorie Stern, Mary Louise Stong, Hilde Kolb and Grace Macduff Parker. For the first few years, volunteers performed every task, including organizing book sales, processing membership contributions, staging special exhibits and sponsoring citywide poetry contests. By the 1980s, Friends began to play a more active role as an advocacy organization for the Library. 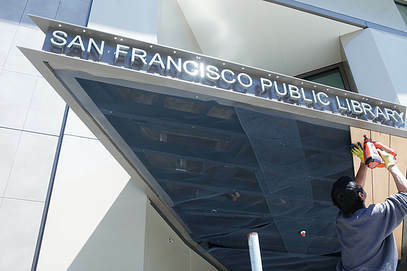 Those efforts first culminated in 1988, when Friends helped San Francisco realize the City’s long time goal of a new Main Library through a campaign for Proposition A, a $109.5 million bond widely supported by City voters. Further, Friends also helped pay for the cost of furniture, fixtures and equipment not covered in the bond. With these successes, and an extraordinary outpouring of more than 17,000 donations from residents and organizations throughout the City and beyond, the vision of a new Main Library became a reality when the new Main opened its doors on April 18, 1996. In 1994, after years of protracted budget fights at City Hall which often left the San Francisco Public Library system underfunded, under-staffed, and with mandated closures, Friends developed and championed the City’s first-ever Library Preservation Fund winning passage of Proposition E with 70% of the vote.. This community-led effort by Friends to establish the Library Preservation Fund which guaranteed15 years of dedicated funding without raising taxes. In 2007, San Franciscans expressed their strong desire for the renewal of the Library Preservation Fund when they overwhelmingly passed Proposition D by 74.5%, more votes than any other proposition on the ballot. The Library Preservation Fund is critical to the current and long-term health of our premier urban public library. It has enabled the increase of operating hours by 53%, the expansion of the budget for books and materials by almost 400%. and has made the San Francisco Public Library one of the only systems in California with every branch (28 of them) open seven days per week. Friends also led the successful advocacy effort in 2000 for 74% voter-approval of a $106 million bond to build and refurbish 24 of the neighborhood branch libraries citywide. Similar with the Main’s rebuild before it, Friends raised $16 million for furniture, fixtures and equipment. The Neighborhood Library Campaign's fundraising success helped to fulfill the citywide dire need to revitalize San Francisco’s neighborhood branch libraries and equip them for the 21st century. ​1961 – 1980s: Led by founder Marjorie Stern, formative years of community grassroots activism providing watchdog oversight leading up to systematic improvements in the Library. ​1987: San Francisco Library Foundation, established around the initiative to raise $30 million to finish and equip the new Main Library on Larkin Street. 1988-1990: Friends leads successful advocacy efforts for approval of the bond measure to build a new Main Library. The Foundation galvanizes support for the City’s diverse communities, resulting in the creation of “affinity centers” dedicated to the experiences of African-American, Latino/Hispanic, Chinese, Filipino, Gay & Lesbian and environmentalist communities. 1994: Friends leads the successful electoral campaign to establish the Library Preservation Fund which provide a consistent and stable budget outside the usual constraints of annual budget fights and requires regular public and community reviews of neighborhood needs, public interests, and the oversight of the budget..
2004-2014: Friends raises $14 million in private funds in the Neighborhood Library Campaign for the public Branch Library Improvement Program, resulting in 24 state-of-the-art neighborhood branches. 2007: Friends leads the campaign to renew the Library Preservation Fund for another 15 years with more than 70% of the community voting yes. 2015: Friends raises funds needed to provision The Mix at SFPL (the Main Library’s new youth-designed 21st century teen digital learning center) with furniture and state-of-the-art computers and equipment for the sound studio, maker space and film studio.